A delightful cottage in the woods in the historic waterside community of Bayside. This cottage is a short 2 minute walk from the beach and dock. Converted from an old stable around 1929 and substantially renovated again in 1988 in traditional cottage finishes. This cottage is as comfortable as it gets. Just off the unpaved side street, this property is rare in the Bayside community in that neighbors aren't as close by. SECURITY DEPOSIT: Not required, accidental damages are covered under the Damage Waiver Plan included with rental of the cottage. I found the site very helpful - staff provided necessary info and it was easy to book and pay for. The screened-in porch is our favorite place to read and play games. The On the Water staff was professional and thorough. It was a pleasure talking with them. My family loved Woodland Lodge and the Bayside community. Our accommodations were charming and full of character. The house was expertly decorated and made us feel right at home. The kitchen was well stocked. And the gardens surrounding the house were beautiful. The only drawback was poor to no Wi-Fi service. Otherwise, Woodland Lodge is the perfect 10! It was seamless and effortless. Love the outside deck with hanging lights and screened in porch for evenings. Agency was very pleasant and helpful! The cabin was well stocked with everything we could need. We especially liked all of the pots, pans and dishes in the kitchen, as well as the indoor and outdoor games! On the Water in Maine was a pleasure to deal with. They gave us all of the info we needed...no surprises. They are attentive to detail and their emails included several helpful links to other area amenities. This was our first time using the agency to book a rental and we look forward to future bookings with them. Plenty of room for two couples. Very homey,comfortable and clean. Well stocked kitchen. Great deck for grilling and hanging out. Nice screened porch area for relaxing. Beautiful landscaped gardens. The place was private and quiet. Ample parking for three vehicles. The Wi-Fi came in handy. 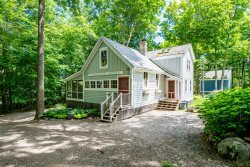 The owners provided a write-up on the history of the cottage, which we appreciated because it is so unique and charming. We always enjoy working with the folks at On the water in Maine. We love this cottage. It's in a quiet location, yet steps away from all the fun. The kitchen is well stocked and spacious. The screened porch is a favorite. Womderful cottage, great amenities. Had a wonderful time and hope to come back again! Very simple and easy to work with On the Water in Maine! A very relaxing cottage, with beautiful landscaping. Very welcoming. The spacious living room and screened in porch provide plenty of places to relax, safe from bugs and weather. We love that our children can explore the lovely little town. We like sitting on the dock at sunset. Working with On the Water in Maine Inc. was great. They were easy to contact and very accommodating. We had a dream vacation in Bayside. Midcoast Maine and Bayside were beautiful, rustic, scenic and charming. A repeat for sure! This is a perfect cottage for families or couples. The kitchen is well stocked, the beds are comfortable, and the screen porch was the favorite sleeping place for our 17 year old. The flowers around the property are beautiful, and our kids enjoyed playing badminton on all the sunny days.